There's something so gratifying about finding a vintage piece that requires absolutely no work. Don't get me wrong, give me a dingy dresser and a can of paint and I can do some serious magic. But finding a piece that's already in just the right color is a real treat [at least for furniture nerds like me!]. 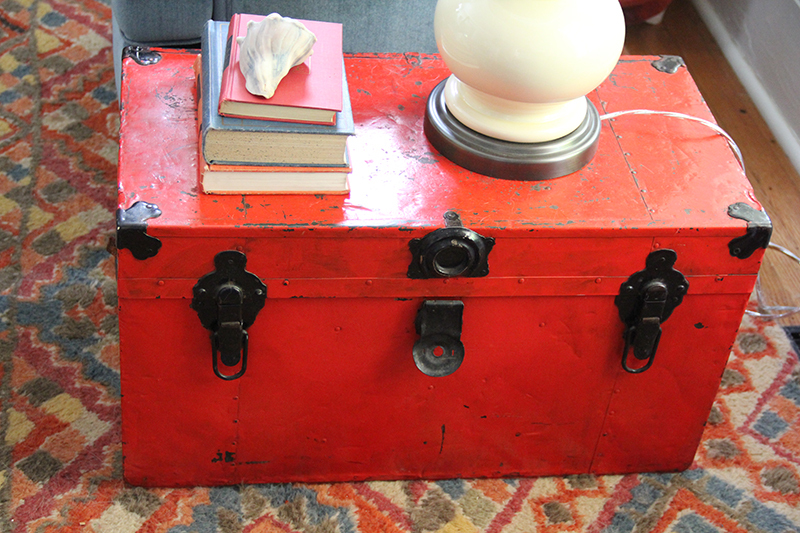 Meet my red trunk. It's old. Real old. It's seriously distressed [in the best way possible]. But what truly sets it apart is that bright, bold tomato red! I've had this baby for several years now and it's had quite a life in my home. It's been a TV stand, a coffee table, an ottoman, and an awesome statement piece in nearly every room of my house. With paint and distressing techniques, I can mimic the vintage look pretty closely, but it's hard to match the perfect old, worn patina that I love about this piece. I still feel iffy about parting with it [I just put it for sale on Craigslist this weekend and it's already getting picked up today!] because this bright red can be hard to come by. Despite my long love for this old steamer, I'm looking to reinvent the house and bring some new pieces in for a bit of change.